The Peacock at Rowsley is a beautiful historic Manor house dating from the 1600s. 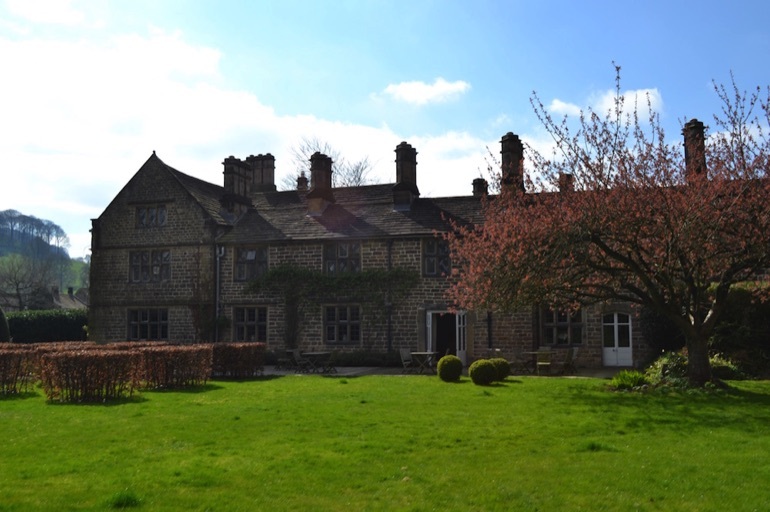 Part of the Haddon Estate, in the stunning Peak District, it's been a hotel since 1832 and has an acclaimed restaurant with three AA rosettes. The menu offers a mouth-watering selection of exciting and innovative dishes, featuring fresh seasonal ingredients. A pre-lunch drink can be enjoyed in the cosy bar. You can really feel the history of the hotel here: leaded windows, beamed ceiling, flagstone floors and a crackling open fire create a warm and welcoming atmosphere – helped along by the friendly and attentive staff. The dining room itself is a stylish but relaxed space with large picture windows overlooking the pretty hotel gardens. Freshness was the theme that ran throughout our meal, thanks to an on-site vegetable garden and locally produced ingredients – including venison from the Haddon Estate. To start, we chose cauliflower soup, and venison and green peppercorn terrine. The soup was garnished with a swirl of garlic oil, and served with crispy croutons and plenty of fluffy, freshly baked bread, while the terrine was served with quince chutney, toasted sourdough and a fresh rocket salad. 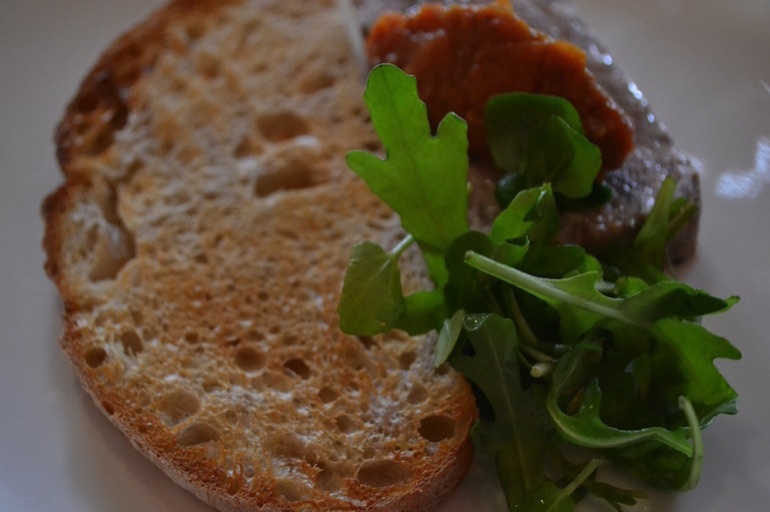 The tangy, fruity chutney complemented the rich, gamey flavour of the terrine beautifully. The choice of main course was diverse, ranging from slow cooked beef brisket to classic haddock and chips. There were daily specials, too – and we chose the Fish of the Day along with a vegetarian option: a wild garlic and nettle risotto. The wild garlic and nettles for this dish are grown in the hotel garden. 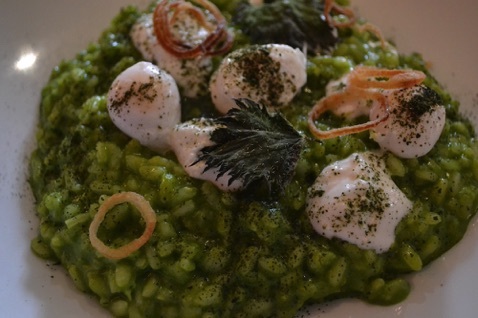 After a little preliminary anxiety about getting a stung tongue, the risotto was declared delicious – and it certainly looked spectacular. The Fish of the Day was a salmon fillet poached in white wine and served with a smoked salmon velouté and Jersey Royal potatoes. 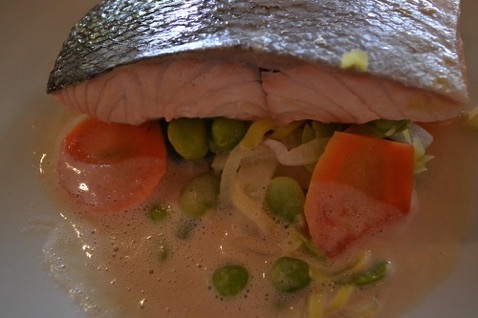 The salmon arrived on a bed of baby broad beans, French beans and thinly sliced carrots – more delicious, spring freshness. The smoky sauce combined wonderfully with the light and delicate salmon, and the crisp vegetables. 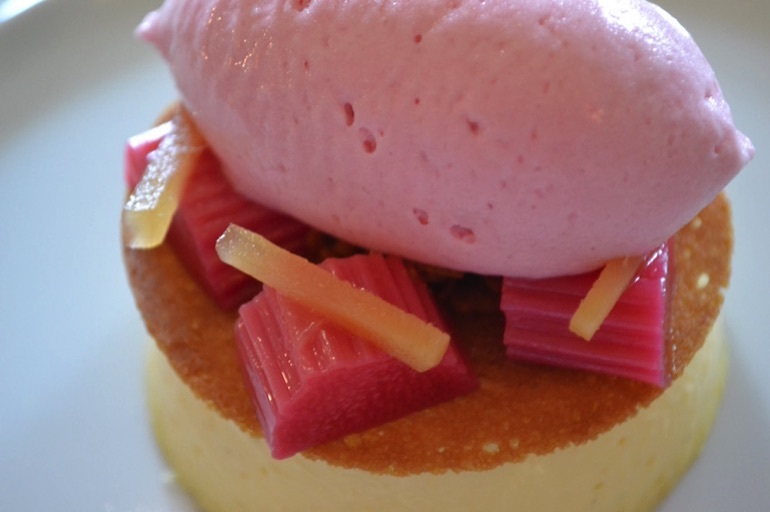 Dessert featured more seasonal flavours: a pink, frothy mound of rhubarb sorbet sitting atop a creamy Crème Catalan, with a garnish of wafer-thin slithers of spicy stem ginger. The Peacock's set price lunch menu is excellent value at £24.95 for three courses. Unlike many other set menus, this one doesn't limit choice to one or two dishes, but offers a superb choice. You'll get a full sized starter and a full sized dessert, with a smaller-sized main course portion – giving you an affordable opportunity to sample a superb fine dining menu without breaking the bank.